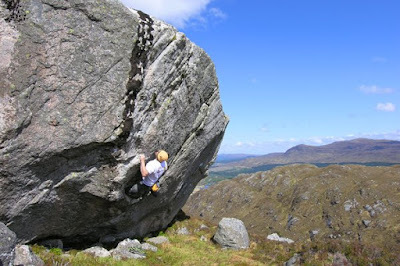 Summer is a time for wandering and exploring remote corners of the glens for the perfect boulder! While trying to round the country and snap some photos for the new 'Great Scottish Climbs' book by Guy Robertson, I've found some great boulders awaiting a return in cooler conditions (when they'll probably be weeping and wet! ), and have also discovered some high summer bouldering. At Allt Coire Giubhsachan, the high glen up left of Steall Meadows in Glen Nevis, Tom Charles Edwards added a few explorative lines to the big boulders up there which he put on Scottish Climbs. 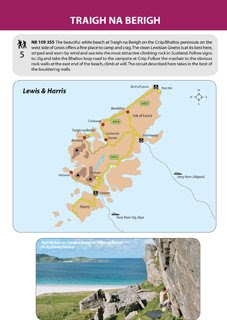 The area is well worth the walk and is listed briefly in the Glen Nevis section of the Bouldering Guide. Getting the Chop Font 7a+** Sit start at the right arête and follow Getting Lippy (6c+) to the left arête, drop down to flat holds and move left to below The Chop (7a). Finish up this. Too Hard Too Far Font 7a*** Sit start at low flat holds right of The Chop। Reverse Getting Lippy (6c+) to holds below the groove of Too Hard Too High (6c+). Finish up this and do battle with it's rounded topout! The bouldering potential at the Sron Ulladale boulders was explored briefly, but its really overshadowed by the lure of the routes! 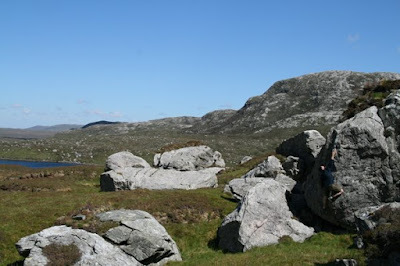 Anyway, there is plenty of bouldering at this venue to keep your strength honed for the harder routes, but if not, the walk is well worth it for the stunning landscape and solitude of Harris, just take your rockboots in case.